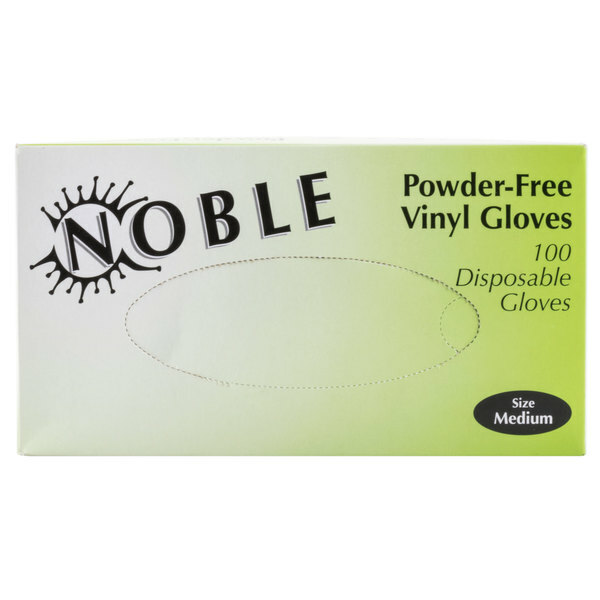 Maintain a safe and sanitary work environment with these Noble Products medium powder-free disposable vinyl gloves! Safe food handling depends on a properly-gloved staff. Made of 3.5 mil thick vinyl, these gloves are a great way to keep your staff in compliance with health code regulations at all times. Perfect for everything from food handling and preparation, to janitorial and housekeeping applications, these gloves are versatile and convenient in any setting! "These vinyl gloves are good quality. They stay on your hand and the plastic doesn't tear easily. We highly recommend this great product. Five stars." Thanks to their powder-free, latex-free design, these gloves are perfect for environments where latex and other allergens may be a concern. For peace of mind, these Noble gloves comply with California Proposition 65 and do not contain DINP. Flexible and resilient, these gloves offer a consistent fit you can depend on! Providing the right size gloves for each of your staff members is a key component to safe food handling. Gloves that are too large may fall off and gloves that are too small are more susceptible to rips and tears. With a variety of sizes to choose from, Noble Products has something for everyone! With their ambidextrous design, these gloves will fit either hand for fast, efficient gloving. 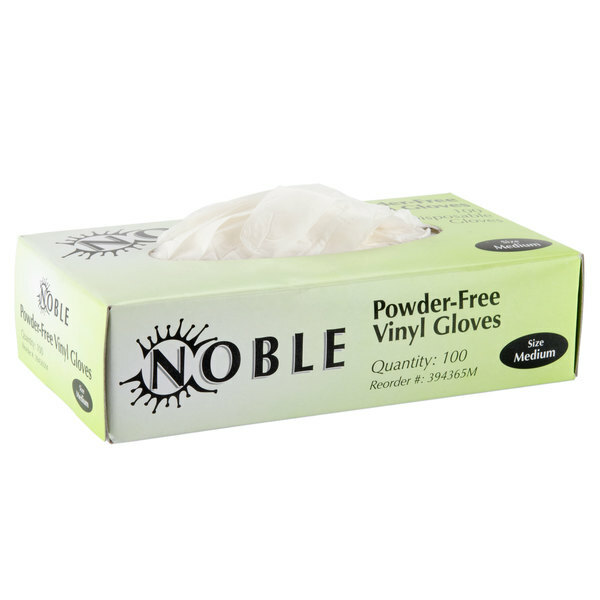 All of the gloves offered by Noble provide a protective barrier between your bare hand and food, or unsanitary conditions. But that doesn’t mean much if used incorrectly. For food handlers, it is always important that gloves be removed before or after handling money, and replaced with a new pair afterwards. Gloves must also be changed at least every four hours during continual use, and after handling raw meat and seafood, or poultry to cut down on cross contamination. Proper removal of disposable gloves is just as important as wearing the gloves properly. Cross contamination between soiled gloves and clean hands can can easily be prevented by following these simple steps. Grasp the outside edge of one of the gloves near the wrist. Peel it away from hand, turning the glove inside out. Hold this glove in the opposite gloved hand, then slide an ungloved finger under the wrist of the remaining glove, careful not to touch the outside of the glove. Peel it off from inside, creating a bag for both gloves. Discard, and wash hands thoroughly. Making gloves easily accessible allows you to slip on a pair even when in a rush. So don’t forget to purchase a wire wall mount glove rack, so that you can keep your gloves within arm’s reach of your sink, prep table, janitor’s closet, and more. When it’s time to shop for a new case of disposable gloves, you want to make sure you get a superior product at a better price, give Noble gloves a try! Noble gloves have proven to be a reliable favorite for many of our customers thanks to their guaranteed quality and incredible prices. With the lowest prices in the industry, on boxes of a hundred gloves and cases of a thousand, Noble gloves ensure a high quality product with a selection of styles and sizes that are sure to meet your every need. 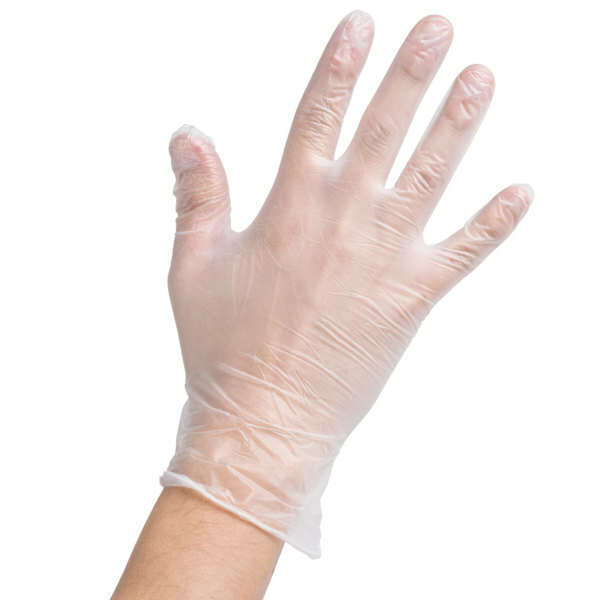 Proper food handling is a vital part of any successful commercial kitchen, and Noble’s food service grade gloves are the perfect way to help you ensure sanitation and prevent cross contamination. The gloves’ durability and elasticity make them ideal for any type of food preparation, while changing and disposing of gloves between tasks is no longer a major blow against your bottom line, thanks to our always low price. Noble gloves are extremely versatile and can be used in a variety of other applications too, perfect for home use or on the job, they are a tremendous option for maintaining sanitary condition in daycare centers, protecting your hands from grease and other abrasives, in light painting, mechanical and industrial jobs, and can even be used for light janitorial work. These food service grade gloves are available in small, medium, large and extra-large sizes with both powdered, and powder free options to choose from. Noble gloves feature color coded boxes, so you can quickly pick out the best glove for a job. With pink, powder-free latex, blue powdered latex, green powder-free vinyl, and yellow powdered vinyl, this easy system will help you grab what you need, when you need it. It’s important to invest in multiple gloves sizes so that you have the ideal fit for all of your employees. Gloves that are too big will not stay on, while those that are too small are more prone to rips and tears. Because you should always have numerous glove sizes on hand, it is also a great idea to install a wall mount glove rack for each size to ensure they are always in reach when needed. We are using this product in my bakery shop. good quality and reasonable on price. Will buy more with a different size. Bought this Medium for my husband but fit me as small size. I ordered these in very sizes for my coffee house. The sizing is true to size. Will definitely recommend and will be ordering these on a regular. These are great for handling desserts. I use them for everything including vendor shows and personal catering events. They last a long time as well. Durable and easy to get on and off. These gloves are helpful for my staff in the kitchen and do not rip easily. Good product. These gloves were perfect! I love that they come in different sizes, all other vinyl gloves came as one size and they would hang off the ends of my fingers leaving tracks in what I was working on. They fit nice, they're powder free and they come in an easily dispensing box. Love these gloves. Multiple uses: medical, household, outdoors or painting. Comes in handy when ever you need to protect your hands and skin. As advertised. These medium gloves made by noble products are outstanding! It is great that they have the option to buy in a case. The price is excellent for what you get. YES, prefer these over the white murky looking one as those tend to have a weird odor and leave a weird taste on the food you're serving. These are our favorite gloves. They are made from vinyl so no need to worry about any allergies to latex. We get the powderfree gloves which we really like. They are durable and the price is great! Noble medium powder free gloves are the best gloves to buy for serving food or for prepping food with. They are high quality and fit great. We go through a lot of Noble disposable vinyl gloves at my business. These things are pretty tear resistant. You can't go wrong with powder or powder free. I ordered M size this time and really gave me a nice fit in my hands , also give nice grip .Nice quality , i will buy again. Bought all sizes, using them for prepping BBQs. They are power-free and pretty durable. Haven't experienced with torn gloves so far. Dirty cheap price for a box of 100 gloves than my local stores. These gloves were a big hit with the teachers at our daycare. The Medium sized gloves fits everyone very well and they are very sturdy and a great price. We use these gloves for diapering and food service. Very very happy with our choice. These are really great gloves that can be used for a variety of food service operation. I really prefer powder-free gloves and found that the medium size fit me the best. At the right price, they won't break the bank when you dispose of them either!